12:00 am 76°F 73°F 89% Overcast. Mild. 76°F 7 mi	 4mph /SE 8% 0.00 "
1:00 am 76°F 72°F 89% Overcast. Mild. 76°F 8 mi	 4mph /SSE 9% 0.00 "
2:00 am 75°F 72°F 91% Overcast. Mild. 74°F 7 mi	 4mph /S 7% 0.00 "
3:00 am 74°F 72°F 93% Mostly cloudy. Mild. 72°F 8 mi	 4mph /SW 5% 0.00 "
4:00 am 74°F 71°F 92% Mostly cloudy. Mild. 72°F 7 mi	 5mph /WSW 2% 0.00 "
5:00 am 74°F 71°F 89% Mostly cloudy. Mild. 73°F 8 mi	 5mph /WNW 2% 0.00 "
6:00 am 72°F 69°F 90% Broken clouds. Mild. 69°F 8 mi	 6mph /NW 2% 0.00 "
7:00 am 71°F 68°F 90% Broken clouds. Cool. 68°F 8 mi	 7mph /NW 2% 0.00 "
8:00 am 72°F 67°F 85% Broken clouds. Mild. 71°F 8 mi	 8mph /NNW 2% 0.00 "
9:00 am 74°F 66°F 75% Broken clouds. Mild. 76°F 7 mi	 10mph /NNW 1% 0.00 "
10:00 am 77°F 65°F 66% Broken clouds. Mild. 79°F 8 mi	 12mph /NNW 0% 0.00 "
11:00 am 80°F 63°F 56% Broken clouds. Warm. 82°F 7 mi	 12mph /N 0% 0.00 "
12:00 pm 84°F 62°F 48% Sunny. Warm. 84°F 8 mi	 12mph /N 0% 0.00 "
1:00 pm 87°F 61°F 42% Sunny. Warm. 87°F 9 mi	 11mph /N 0% 0.00 "
2:00 pm 88°F 60°F 39% Sunny. Warm. 88°F 10 mi	 11mph /N 0% 0.00 "
3:00 pm 89°F 60°F 37% Sunny. Warm. 88°F 10 mi	 11mph /NNE 0% 0.00 "
4:00 pm 89°F 60°F 37% Sunny. Warm. 89°F 9 mi	 11mph /NE 0% 0.00 "
5:00 pm 88°F 60°F 39% Sunny. Warm. 87°F 9 mi	 12mph /NE 0% 0.00 "
6:00 pm 86°F 60°F 42% Sunny. Warm. 86°F 9 mi	 13mph /ENE 0% 0.00 "
7:00 pm 83°F 60°F 47% Sunny. Warm. 83°F 8 mi	 12mph /ENE 0% 0.00 "
8:00 pm 79°F 61°F 55% Clear. Mild. 80°F 8 mi	 10mph /ENE 0% 0.00 "
9:00 pm 76°F 62°F 63% Clear. Mild. 78°F 7 mi	 8mph /ENE 0% 0.00 "
10:00 pm 71°F 63°F 78% Clear. Cool. 72°F 8 mi	 6mph /E 0% 0.00 "
11:00 pm 69°F 64°F 84% Clear. Cool. 69°F 7 mi	 5mph /E 0% 0.00 "
12:00 am 68°F 64°F 87% Clear. Cool. 68°F 7 mi	 4mph /ESE 0% 0.00 "
1:00 am 68°F 64°F 88% Clear. Cool. 68°F 7 mi	 4mph /SE 0% 0.00 "
2:00 am 67°F 64°F 89% Clear. Cool. 67°F 8 mi	 4mph /S 0% 0.00 "
3:00 am 67°F 64°F 89% Clear. Cool. 67°F 7 mi	 4mph /SW 0% 0.00 "
4:00 am 67°F 63°F 88% Clear. Cool. 67°F 8 mi	 4mph /SW 0% 0.00 "
5:00 am 67°F 63°F 86% Clear. Cool. 67°F 7 mi	 4mph /SW 0% 0.00 "
6:00 am 67°F 62°F 86% Sunny. Cool. 67°F 7 mi	 4mph /WSW 0% 0.00 "
7:00 am 65°F 62°F 88% Sunny. Cool. 65°F 7 mi	 4mph /WSW 0% 0.00 "
8:00 am 66°F 62°F 84% Sunny. Cool. 66°F 7 mi	 4mph /WSW 0% 0.00 "
9:00 am 72°F 62°F 73% Sunny. Cool. 74°F 7 mi	 4mph /WSW 0% 0.00 "
10:00 am 77°F 64°F 64% Sunny. Mild. 79°F 7 mi	 4mph /SW 0% 0.00 "
11:00 am 81°F 62°F 53% Sunny. Warm. 82°F 9 mi	 4mph /SSE 0% 0.00 "
12:00 pm 85°F 59°F 42% Sunny. Warm. 85°F 8 mi	 6mph /ENE 0% 0.00 "
1:00 pm 89°F 57°F 35% Sunny. Pleasantly warm. 88°F 10 mi	 7mph /ENE 0% 0.00 "
2:00 pm 90°F 57°F 33% Sunny. Pleasantly warm. 89°F 9 mi	 8mph /ENE 0% 0.00 "
3:00 pm 91°F 57°F 33% Sunny. Pleasantly warm. 89°F 10 mi	 10mph /E 0% 0.00 "
4:00 pm 89°F 58°F 34% Sunny. Pleasantly warm. 88°F 9 mi	 12mph /E 0% 0.00 "
5:00 pm 88°F 58°F 36% Sunny. Warm. 87°F 9 mi	 12mph /E 0% 0.00 "
6:00 pm 86°F 58°F 39% Sunny. Warm. 85°F 8 mi	 12mph /E 0% 0.00 "
7:00 pm 82°F 59°F 46% Sunny. Warm. 82°F 8 mi	 11mph /E 0% 0.00 "
8:00 pm 79°F 60°F 53% Clear. Mild. 80°F 7 mi	 9mph /ESE 0% 0.00 "
9:00 pm 75°F 63°F 65% Clear. Mild. 77°F 7 mi	 6mph /E 0% 0.00 "
10:00 pm 70°F 64°F 82% Clear. Cool. 70°F 8 mi	 6mph /ESE 0% 0.00 "
11:00 pm 67°F 64°F 91% Clear. Cool. 67°F 8 mi	 5mph /ESE 0% 0.00 "
12:00 am 68°F 65°F 89% Clear. Cool. 68°F 7 mi	 5mph /SE 0% 0.00 "
1:00 am 69°F 65°F 88% Clear. Cool. 69°F 7 mi	 5mph /SSE 0% 0.00 "
2:00 am 68°F 65°F 89% Clear. Cool. 68°F 8 mi	 6mph /SSE 0% 0.00 "
3:00 am 67°F 65°F 91% Clear. Cool. 67°F 7 mi	 6mph /SSE 0% 0.00 "
4:00 am 68°F 64°F 89% Clear. Cool. 68°F 8 mi	 6mph /S 0% 0.00 "
5:00 am 68°F 64°F 88% Clear. Cool. 68°F 7 mi	 6mph /S 0% 0.00 "
6:00 am 67°F 64°F 91% Sunny. Cool. 67°F 8 mi	 5mph /S 0% 0.00 "
7:00 am 67°F 64°F 92% Sunny. Cool. 67°F 7 mi	 6mph /S 0% 0.00 "
8:00 am 68°F 65°F 90% Mostly sunny. Cool. 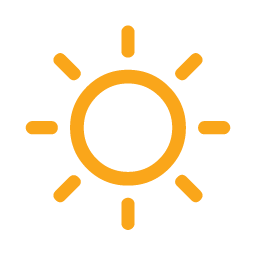 68°F -	 7mph /SSE 1% 0.00 "
9:00 am 72°F 66°F 81% Mostly sunny. Mild. 72°F -	 10mph /SSE 2% 0.00 "
10:00 am 77°F 66°F 69% Mostly sunny. Mild. 78°F -	 12mph /SSE 2% 0.00 "
11:00 am 81°F 65°F 59% Mostly sunny. Warm. 82°F -	 14mph /SSE 2% 0.00 "
12:00 pm 83°F 63°F 50% Mostly sunny. Warm. 84°F -	 15mph /SSE 1% 0.00 "
1:00 pm 86°F 62°F 45% Mostly sunny. Warm. 87°F -	 16mph /SSE 1% 0.00 "
2:00 pm 87°F 62°F 43% Mostly sunny. Warm. 87°F -	 17mph /SSE 1% 0.00 "
3:00 pm 87°F 61°F 42% Mostly sunny. Warm. 87°F -	 17mph /SSE 1% 0.00 "
4:00 pm 86°F 61°F 44% Mostly sunny. Warm. 86°F -	 17mph /SE 0% 0.00 "
5:00 pm 85°F 62°F 46% Mostly sunny. Warm. 85°F -	 17mph /SE 0% 0.00 "
6:00 pm 83°F 62°F 51% Mostly sunny. Warm. 83°F -	 16mph /SE 0% 0.00 "
7:00 pm 80°F 63°F 57% Mostly sunny. Mild. 81°F -	 15mph /SE 0% 0.00 "
8:00 pm 77°F 64°F 65% Mostly clear. Mild. 79°F -	 13mph /SE 0% 0.00 "
9:00 pm 75°F 65°F 72% Mostly clear. Mild. 77°F -	 10mph /SSE 0% 0.00 "
10:00 pm 72°F 66°F 81% Mostly clear. Mild. 73°F -	 8mph /SSE 0% 0.00 "
11:00 pm 72°F 66°F 83% Mostly clear. Cool. 72°F -	 8mph /SSE 0% 0.00 "
12:00 am 72°F 66°F 83% Mostly clear. Mild. 72°F -	 8mph /SSE 0% 0.00 "
1:00 am 71°F 67°F 86% Mostly clear. Cool. 70°F -	 8mph /SSE 0% 0.00 "
2:00 am 71°F 67°F 87% Mostly clear. Cool. 69°F -	 8mph /SSE 0% 0.00 "
3:00 am 71°F 67°F 88% Mostly clear. Cool. 69°F -	 8mph /SSE 0% 0.00 "
4:00 am 70°F 67°F 88% Mostly clear. Cool. 68°F -	 7mph /SSE 0% 0.00 "
5:00 am 70°F 67°F 90% Mostly clear. Cool. 70°F -	 7mph /SSE 1% 0.00 "
6:00 am 70°F 67°F 91% Mostly sunny. Cool. 70°F -	 7mph /SSE 1% 0.00 "
7:00 am 70°F 67°F 91% Mostly sunny. Cool. 70°F -	 8mph /SE 1% 0.00 "
8:00 am 71°F 67°F 89% Mostly sunny. Cool. 69°F -	 10mph /SE 1% 0.00 "
9:00 am 75°F 68°F 79% Mostly sunny. Mild. 76°F -	 13mph /SE 1% 0.00 "
10:00 am 80°F 68°F 68% Mostly sunny. Mild. 82°F -	 15mph /SE 1% 0.00 "
11:00 am 82°F 68°F 62% Mostly sunny. Warm. 85°F -	 16mph /SE 1% 0.00 "
12:00 pm 84°F 67°F 57% Mostly sunny. Warm. 87°F -	 17mph /SE 1% 0.00 "
1:00 pm 86°F 67°F 53% Passing clouds. Warm. 88°F -	 18mph /SE 1% 0.00 "
2:00 pm 86°F 66°F 51% Passing clouds. Warm. 89°F -	 19mph /SE 1% 0.00 "
3:00 pm 86°F 66°F 51% Passing clouds. Warm. 88°F -	 19mph /SE 1% 0.00 "
4:00 pm 86°F 66°F 51% Passing clouds. Warm. 88°F -	 19mph /SE 1% 0.00 "
5:00 pm 85°F 66°F 54% Passing clouds. Warm. 87°F -	 18mph /SE 1% 0.00 "
6:00 pm 83°F 66°F 58% Passing clouds. Warm. 85°F -	 18mph /SE 1% 0.00 "
7:00 pm 80°F 67°F 64% Passing clouds. Warm. 82°F -	 17mph /SE 1% 0.00 "
8:00 pm 78°F 67°F 70% Passing clouds. Mild. 80°F -	 15mph /SE 1% 0.00 "
9:00 pm 76°F 68°F 77% Passing clouds. Mild. 78°F -	 12mph /SE 1% 0.00 "
10:00 pm 74°F 69°F 84% Passing clouds. Mild. 74°F -	 10mph /SE 1% 0.00 "
11:00 pm 74°F 69°F 85% Passing clouds. Mild. 73°F -	 10mph /SE 4% 0.00 "
12:00 am 74°F 69°F 85% Passing clouds. Mild. 73°F -	 11mph /SE 6% 0.00 "
1:00 am 73°F 69°F 87% Passing clouds. Mild. 72°F -	 11mph /SE 9% 0.00 "
2:00 am 73°F 69°F 88% Partly cloudy. Mild. 72°F -	 10mph /SE 8% 0.00 "
3:00 am 73°F 69°F 89% Partly cloudy. Mild. 71°F -	 10mph /SE 7% 0.00 "
4:00 am 73°F 69°F 89% Partly cloudy. Mild. 71°F -	 10mph /SSE 7% 0.00 "
5:00 am 72°F 69°F 90% Partly cloudy. Mild. 70°F -	 10mph /SSE 6% 0.00 "
6:00 am 72°F 69°F 90% a mixture of sun and clouds. Mild. 69°F -	 9mph /SE 6% 0.00 "
7:00 am 72°F 69°F 90% a mixture of sun and clouds. Mild. 70°F -	 9mph /SE 5% 0.00 "
8:00 am 73°F 69°F 88% a mixture of sun and clouds. Mild. 72°F -	 11mph /SE 5% 0.00 "
9:00 am 77°F 70°F 78% a mixture of sun and clouds. Mild. 79°F -	 15mph /SE 4% 0.00 "
10:00 am 81°F 70°F 69% a mixture of sun and clouds. Warm. 84°F -	 17mph /SE 3% 0.00 "
11:00 am 83°F 70°F 63% a mixture of sun and clouds. Warm. 87°F -	 19mph /SE 3% 0.00 "
12:00 pm 85°F 69°F 59% a mixture of sun and clouds. Warm. 89°F -	 21mph /SSE 3% 0.00 "
1:00 pm 86°F 69°F 56% Passing clouds. Warm. 90°F -	 22mph /SSE 2% 0.00 "
2:00 pm 87°F 68°F 54% Passing clouds. Warm. 90°F -	 22mph /SSE 2% 0.00 "
3:00 pm 87°F 68°F 54% Passing clouds. Warm. 91°F -	 22mph /SSE 2% 0.00 "
4:00 pm 87°F 69°F 55% Passing clouds. Warm. 91°F -	 22mph /SSE 2% 0.00 "
5:00 pm 86°F 69°F 58% Passing clouds. Warm. 90°F -	 21mph /SE 3% 0.00 "
6:00 pm 84°F 71°F 64% Passing clouds. Warm. 89°F -	 20mph /SE 4% 0.00 "
7:00 pm 81°F 71°F 71% Passing clouds. Warm. 85°F -	 19mph /SE 4% 0.00 "
8:00 pm 81°F 72°F 75% Passing clouds. Warm. 85°F -	 17mph /SE 4% 0.00 "
9:00 pm 78°F 73°F 82% Passing clouds. Mild. 81°F -	 14mph /SE 4% 0.00 "
10:00 pm 77°F 73°F 87% Passing clouds. Mild. 79°F -	 13mph /SE 3% 0.00 "
11:00 pm 78°F 73°F 87% Passing clouds. Mild. 79°F -	 14mph /SSE 7% 0.00 "
Showers early. a mixture of sun and clouds. Warm. 12:00 am 78°F 73°F 86% Passing clouds. Mild. 81°F -	 15mph /SSE 10% 0.00 "
1:00 am 78°F 73°F 86% a few showers. Passing clouds. Mild. 80°F -	 15mph /SSE 27% 0.00 "
2:00 am 78°F 73°F 87% a few showers. Cloudy. Mild. 79°F -	 16mph /SSE 25% 0.00 "
3:00 am 77°F 73°F 88% Cloudy. Mild. 79°F -	 17mph /SSE 12% 0.00 "
4:00 am 77°F 73°F 88% Cloudy. Mild. 78°F -	 17mph /SSE 11% 0.00 "
5:00 am 77°F 73°F 88% Cloudy. Mild. 78°F -	 17mph /SSE 10% 0.00 "
6:00 am 76°F 73°F 89% a mixture of sun and clouds. Mild. 77°F -	 16mph /SSE 10% 0.00 "
7:00 am 76°F 73°F 89% a mixture of sun and clouds. Mild. 77°F -	 15mph /SSE 9% 0.00 "
8:00 am 78°F 73°F 86% a mixture of sun and clouds. Mild. 79°F -	 18mph /SSE 8% 0.00 "
9:00 am 80°F 72°F 77% a mixture of sun and clouds. Warm. 84°F -	 21mph /SSE 8% 0.00 "
10:00 am 82°F 72°F 71% a mixture of sun and clouds. Warm. 87°F -	 23mph /SSE 7% 0.00 "
11:00 am 84°F 72°F 66% a mixture of sun and clouds. Warm. 90°F -	 24mph /SSE 8% 0.00 "
12:00 pm 86°F 72°F 62% a mixture of sun and clouds. Warm. 92°F -	 26mph /SSE 8% 0.00 "
1:00 pm 87°F 72°F 60% a mixture of sun and clouds. Warm. 93°F -	 26mph /SSE 9% 0.00 "
2:00 pm 88°F 71°F 58% a mixture of sun and clouds. Warm. 94°F -	 25mph /SSE 8% 0.00 "
3:00 pm 89°F 71°F 57% a mixture of sun and clouds. Warm. 95°F -	 24mph /SSE 7% 0.00 "
4:00 pm 88°F 72°F 58% a mixture of sun and clouds. Warm. 95°F -	 23mph /SSE 7% 0.00 "
5:00 pm 87°F 72°F 61% a mixture of sun and clouds. Warm. 93°F -	 22mph /SSE 7% 0.00 "
6:00 pm 85°F 73°F 66% a mixture of sun and clouds. Warm. 91°F -	 22mph /SSE 8% 0.00 "
7:00 pm 83°F 73°F 73% a mixture of sun and clouds. Warm. 88°F -	 21mph /SSE 8% 0.00 "
8:00 pm 82°F 73°F 76% Cloudy. Warm. 87°F -	 19mph /SSE 7% 0.00 "
9:00 pm 80°F 74°F 82% Cloudy. Mild. 84°F -	 17mph /SSE 6% 0.00 "
10:00 pm 78°F 74°F 86% Cloudy. Mild. 81°F -	 17mph /SSE 5% 0.00 "
11:00 pm 78°F 74°F 87% Cloudy. Mild. 81°F -	 16mph /SSE 5% 0.00 "
12:00 am 78°F 74°F 87% Cloudy. Mild. 80°F -	 15mph /SSE 5% 0.00 "
1:00 am 78°F 73°F 87% Cloudy. Mild. 79°F -	 14mph /SSE 5% 0.00 "
2:00 am 77°F 73°F 88% Cloudy. Mild. 79°F -	 14mph /SSE 4% 0.00 "
3:00 am 77°F 73°F 89% Cloudy. Mild. 78°F -	 14mph /SSE 4% 0.00 "
4:00 am 77°F 73°F 89% Cloudy. Mild. 77°F -	 14mph /SSE 4% 0.00 "
5:00 am 77°F 73°F 89% Cloudy. Mild. 78°F -	 15mph /SSE 5% 0.00 "
6:00 am 76°F 73°F 89% a mixture of sun and clouds. Mild. 77°F -	 17mph /SSE 7% 0.00 "
7:00 am 76°F 73°F 88% a mixture of sun and clouds. Mild. 77°F -	 17mph /SSE 8% 0.00 "
8:00 am 78°F 73°F 84% a mixture of sun and clouds. Mild. 80°F -	 19mph /SSE 8% 0.00 "
9:00 am 80°F 73°F 77% a mixture of sun and clouds. Warm. 85°F -	 21mph /SSE 7% 0.00 "
10:00 am 83°F 73°F 71% a mixture of sun and clouds. Warm. 88°F -	 22mph /SSE 7% 0.00 "
11:00 am 85°F 73°F 66% a mixture of sun and clouds. Warm. 91°F -	 23mph /SSE 7% 0.00 "
12:00 pm 87°F 73°F 62% a mixture of sun and clouds. Warm. 94°F -	 23mph /SSE 7% 0.00 "
1:00 pm 88°F 73°F 60% a mixture of sun and clouds. Warm. 95°F -	 24mph /SSE 7% 0.00 "
2:00 pm 89°F 72°F 57% a mixture of sun and clouds. Warm. 96°F -	 23mph /SSE 7% 0.00 "
3:00 pm 89°F 72°F 57% a mixture of sun and clouds. Warm. 96°F -	 23mph /SSE 7% 0.00 "
4:00 pm 89°F 72°F 56% a mixture of sun and clouds. Warm. 96°F -	 23mph /SSE 7% 0.00 "
5:00 pm 88°F 72°F 60% a mixture of sun and clouds. Warm. 95°F -	 23mph /SSE 9% 0.00 "
6:00 pm 86°F 73°F 65% a mixture of sun and clouds. Warm. 93°F -	 22mph /SSE 11% 0.00 "
a mixture of sun and clouds. Warm. Showers early. Morning clouds. Hot. A few tstorms. Clearing skies. Warm. Tstorms early. Breaks of sun late. Warm. APRIL 20TH, 1920 Deadly tornadoes in Mississippi and Alabama killed 219 persons. APRIL 19TH, 1775 The first engagement of the Revolutionary War took place under clear crisp weather at Lexington-Concord.